A rescue from another dogfight. In a dramatic action, The HSUS was on the scene yesterday in Chester County, South Carolina, assisting local authorities in breaking up a massive dogfight-an event that Chris Schindler, animal fighting manager at The HSUS, described as being "likely one of the largest if not the largest dogfights ever taken down." Using intelligence provided by The HSUS, officers of the Chester County Sheriff's Office and York County Sheriff's Office entered the property overnight as the dogfights were in progress, just in time to recover four dogs, including the winning dog from a match that had just taken place, and the losing dog that the dogfighters were about to kill. "Hundreds of people were in attendance – I've never seen anything like it before," said Chris who's been involved in raids on multiple illegal dogfights during his career with The HSUS. Authorities arrested three alleged dogfighters who had brought dogs to the fight from North Carolina, charging them under the state law that The HSUS worked to enact some years ago. We expect other arrests to follow. The pit location appeared to be a permanent set up, with lighting throughout the makeshift facility. There even were lights strung the entire way throughout the pathways down to the pit. Numerous firearms were found tossed throughout the area as well as narcotics, proving an oft-cited observation: operations that exploit animals in this way are often tangled up with other illegal enterprises. There were also the tools of the trade seized on site, including medical kits, scales for pre-fight pairings of dogs, and breaksticks (which separate the dogs when the handlers decide that's needed). Unfortunately, none of the spectators were arrested as they fled the scene. 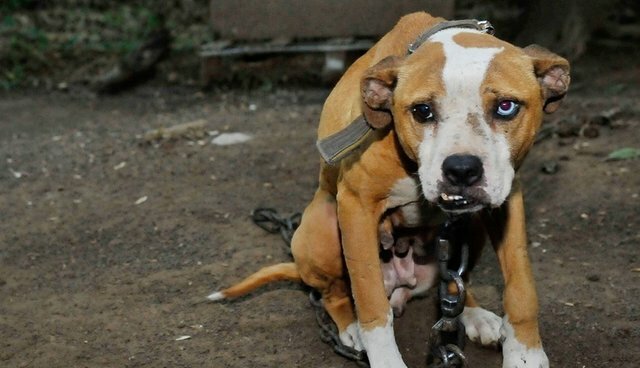 Dogfighting is a felony in all 50 states, but in South Carolina, spectators only face a misdemeanor charge for the first and second offenses. Oddly enough, penalties for being a spectator at a cockfight are higher. This is a circumstance in South Carolina law we've been working to correct, and we now have plenty of evidence to demonstrate why it's needed. In a majority of other states, attendance at a dogfight is a felony, and we could have worked with law enforcement to round up the whole sorry bunch of people involved in this criminal enterprise. All of the dogs removed from the property, including two who were severely injured, will receive veterinary treatment. Congratulations to The HSUS's Animal Rescue Team and law enforcement authorities in Chester and York counties for their hard work and initiative in breaking up this fight and ensuring that these dogs will never again have to participate in a fight. For dogfighters, including those who were not charged, you'll have no rest and no security, since The HSUS will be after you until the last pit is raided and shuttered.